ST 37 - "And Then What"
For over two decades now, Austin, Texas based ST 37 have been cranking out their own unique brand of space rock, psychedelia, punk, and just plain mind-fucked music. Their latest is an LP only release from Noiseville Records in a numbered edition of 500. 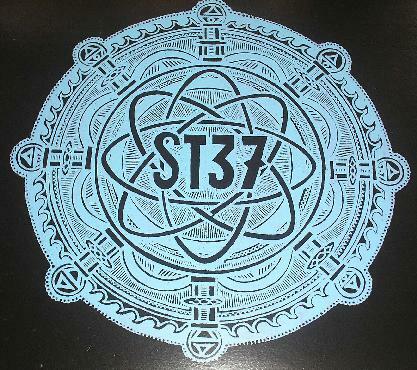 "Thirst" and "I Let it Slip Away" are both songs in the classic ST 37 style. "Thirst" is a slowly stoned droning grungy psych rock song with crashing, bubbling and ripping liquid psychedelic guitars combined with a sludgy stoner vibe. "I Let it Slip Away" starts off as a song, but about halfway through the band take off into deep space acid psych guitar heaven. "First Light" was originally part of the score ST 37 composed for the Fritz Lang film Destiny and performed at the Alamo Draft House in Austin in 1998. This bit features 10 minutes of eastern raga styled psychedelia blended with slowly searing atmospheric acid guitars. Things start off trippy but the high tension factor soon kicks in and things get lysergically menacing as the guitars whine, moan, bubble, shimmer and howl. "Invocation of my Demon Brother" is a total freakout jam that's like Amon Düüll II gone noise-psych. The band are in free-wheeling improv mode and really let chaos reign as they go for a complete jackhammer approach to cerebral destruction. Remember the "here's your brain on drugs" commercials with the egg frying in the pan? You get the idea. "Watch the Bile Come Out" is barely over two minutes but makes its point without any fussing about, being a raucous slab of blazing space punk. "Future Memories" is a cover of a song by Don Falcone (Spirits Burning). Wow, this sucker is INTENSE! The band go completely stoner psych, closing the album with the complete opposite of a soft landing. Oh, and we've got a cool cover of the Roky Erickson song, "Birds'd Crash", done up ST 37 style. Overall this album is a to-die-for set for fans of truly freaked out psychedelic guitar. Vinyl fans come hither. Hope you haven't thrown away your turntables yet.